80mm Clear Quartz Crystal Spheres / Balls from Brazil. Hand picked from 100's of spheres direct from the mines, these Clear Quartz Spheres have good clarity with some veils, rainbow inclusions and small milky semi-translucent portions. Quartz Crystal is a staple of Feng Shui Chi cures and is said to heal past wounds and re-vitalize one's Life or Chi energies. Excellent polish and finish with no cracks. The Oriental Rosewood Stand is sold separately. 80mm or 3 1/8" Sphere - 1lbs 7 1/2ozs. 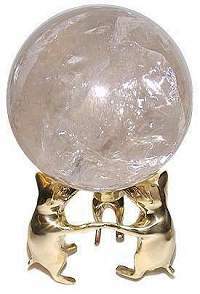 85mm Clear Quartz Crystal Spheres / Balls from Brazil. Hand picked from 100's of spheres direct from the mines, these Clear Quartz Spheres have good clarity with some veils, rainbow inclusions and small milky semi-translucent portions. Quartz Crystal is a staple of Feng Shui Chi cures and is said to heal past wounds and re-vitalize one's Life or Chi energies. Excellent polish and finish with no cracks. The Oriental Rosewood Stand is sold separately. 90mm Clear Quartz Crystal Spheres / Balls from Brazil. Hand picked from 100's of spheres direct from the mines, these Clear Quartz Spheres have good clarity with some veils, rainbow inclusions and small milky semi-translucent portions. Quartz Crystal is a staple of Feng Shui Chi cures and is said to heal past wounds and re-vitalize one's Life or Chi energies. Excellent polish and finish with no cracks. The Large Oriental Wood Stand is sold separately. 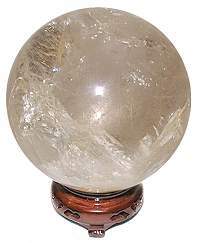 115mm Clear Quartz Crystal Sphere/Ball from Brazil. 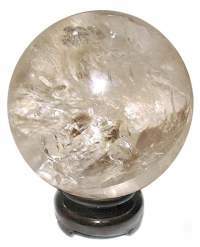 This large quartz ball has good clarity with areas of rainbow mirror like inclusions and fine veils. Super polish and finish with no cracks The Large Oriental Wood Stand is sold separately. 115mm or 4 5/8" Sphere - 4lbs 4ozs. 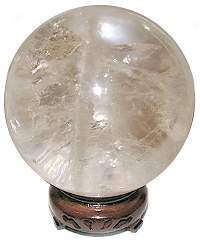 110mm Clear Quartz Crystal Sphere/Ball from Brazil. This large quartz ball has good clarity with areas of rainbow mirror like inclusions and fine veils. Super polish and finish with no cracks The Brass Sphere Stand is sold separately. 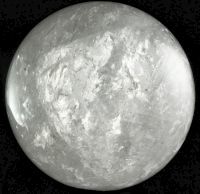 110mm or 4 3/8" Sphere - 4lbs 2ozs. 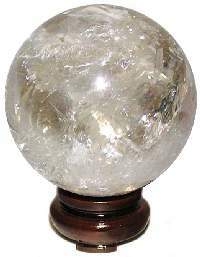 Very rare 200mm Clear Quartz Crystal Sphere/Ball from Brazil. This large quartz ball has large areas of clarity with evenly spaced areas of rainbow inclusions and fine veils allowing the light to pass through from all directions. Super polish and finish with no cracks.